The physio began his life in the sport with the Stubbing Lane club and credits one of his teachers at Valley for propelling him into a career he never could have dreamed of. Worksop Rugby Club, Studding Lane. 'Worksop V Bingham. 'Picture: Phil Pask, British Lions and England physio. Pask has been part of 250 test matches as England phsyio, gone to five Rugby World Cups and worked an incredible 20 Six Nations tournaments. Ahead of the Lions tour of New Zealand he’s thankful for those humble beginnings in rugby. “I wouldn’t be here if I hadn’t had the support and encouragement from the guys who helped me play rugby when I was at Worksop,” said the man who went on to play 150 times for Northampton Saints before becoming a physiotherapist. “That was my springboard and through Valley Comprehensive as well, through a guy called Jeff Dowson who was my PE teacher and played for Wakefield, a really good team at the time. “He put so much time and effort into our school team. “From the age of 11 going to Valley, without that support I woudln’t have even got a foot on the rugby pathway. He can scarcely believe what has happened since he left Bassetlaw but hopes the professional game will have a future in store for Worksop youngsters just starting out. “As a kid I used to sit watching the Four Nations or whatever it was on tele, I would never have dreamt of being involved in 20 tournaments. 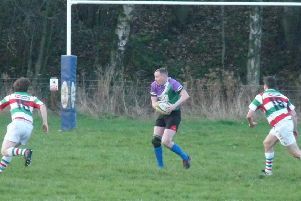 Pask has maintained his connection to Worksop Rugby Club and still has family in the town. He’s hoping to catch up with some of his old pals out in New Zealand on rare moments of down-time during a hectic trip. “I’ve had loads of messages already and I know there’s a group going out from Worksop, they’ve saved for years to go on this tour,” he said. “They’ve made some huge flags, 10m by 6m flags with Worksop on it that I’ll have to keep an eye out for. “The nice thing about the Lions tour is that we’re not detatched from the fans, like soccer, we’ll be able to get out and meet them for a coffee or maybe a beer, like we did in Melbourne, Australia. The physio is one of the most experienced men in his field within international rugby. His first taste of a Lions tour came 12 years ago when they last took on the All Blacks and were on the wrong end of a series whitewash. Whilst some of the younger players wearing the red jerseys this time round will still be getting to know their new team-mates, Pask and his medical colleagues have the benefit of long-standing working relationships. “After the last one I thought you can’t really top that, a series win in Australia but then I got asked again and you can’t turn it down, can you? “Another physio, Bob Stewart has done four with me. “Prav Mathema the Welsh physio this is his third working with us. And it’s the Irish doctor Eanna Falvey’s second so we’ve all worked together. Coming from the four nations who supply the talent for the Lions, the medical staff were all well acquainted with the players they’ll be looking after even before the past fortnight of training sessions. Pask expects them to hit the ground running on Saturday when they take on a Provincial Barbarians XV at Toll Stadium, Whangarei. But not all of the touring party, a group he calls the best of the best, will be familiar with the atmosphere that surrounds a Lions side. He said: “Some of our players don’t know what’s coming – 25,000 fans wearing red jerseys in New Zealand following the team around. “It’s unbelievable, streets are paved in red Lions jerseys. “It’s retained that special aura and even though I’m not playing, even to get asked to do it, to be part of the management is just a great honour and a great privilege. Not many people get a chance to do it. “To get selected itself is pretty special, to get a test jersey means you are the best of the best and it’s pretty unique, hard to achieve. “When we go away to play it’s special - New Zealand haven’t had a chance to play the British Lions for 12 years. “They are as excited, the New Zealand public and the All Blacks players, because they get one opportunity in their career to play in a Lions test series and make history. “We’ve been professional since 1995 but this unites rugby, it transcends any club and country issues or challenges you might have. All the clubs want their players to get selected for the Lions, all the coaches, all the players. Pask flies out tomorrow, a day ahead of the players, and will have thrown himself into his duties as the jet lag is just subsiding. Those duties will take up the vast majority of his waking moments from now until the end of the 2017 tour. “We started two weeks ago and there’s not a lot of respite now,” he said. “With two games a week you’re either preparing a team to play or recovering the team that’s played, 42 players. “There aren’t really enough hours in the day. It’s full on. “We’re experienced in doing it. “It takes two days or so to settle into a routine and then you’re focused on the job, you roll out of bed and into the treatment room, training, recovery, the treatment room and then bed. “It’s only a six week tour, you wouldn’t work all year like that, but because it’s such an intense period you just take a deep breath and bang, get on with it.